When summer rolls around and there are what seems like endless stalls of delicious fruit and vegetables to choose from at the farmers market my thoughts turn to pies in all forms. A cobbler although not considered a pie is similar in principal. Plums are one of my favorite summer fruits and I literally am like a child in a candy store when I see all the wonderful varieties at the market. I saw these gorgeous blood plums the other day and bought a lot of them, most I eat a la naturale, but with the rest I make spiced plum jam and this simple cobbler. The crust was inspired by the galette dough with a little extra sugar and less liquid, making it biscuit like. I used the plums, skin and all, and gently spiced them. It’s wonderful served warm with vanilla ice cream or just a little thick heavy cream. Cut the butter into the dry ingredients, add the sour cream and milk and mix just until combined. Combine plums, sugar and spices, stir. Place spiced plums in 4 (8 oz size) individual ramekins. Spoon the dough over the plums, spread so it’s covering almost all of the fruit, sprinkle top with a little sugar (optional) and bake at 375 degrees for 30 minutes or until cobbler is golden brown and bubbly. Oh totally agree, I love plums. Thank you so much! I love cobblers, they are so wonderful, make me think of home. Thanks so much. You are a life saver and your delectable plum cobbler is a gobbler. As in … I want to gobble it up. (I’ve been hanging out too much with a five year old I think.) There really are some really good looking plums at the market right now. Bounty of summer makes up for the heat. LOL, hanging with a 5 year old is a good thing. Gobbler, LOL!!! Thanks so much Azita. Plums are my fave, so many varieties and they are so sweet and delicious!! I so recommend plums, they make a wonderful cobbler. Thank you so much. We are on the same wave length, can’t wait to see your cherry cobbler, next to plums cherries are next on my list. Thank you so much Susan. Oh I wish you lived close, just think of the feasts we could have. Thanks so much Fae, we would have a wonderful time! Thanks so much, it’s a lovely treat, just you and your cobbler!! So tempting! I spotted some plums at Grand Army Plaza last weekend but resisted because I knew we’d be busy all week with no time to cook. Can’t wait to drown myself in stone fruit next week! I know that over the next few weeks more and more plums will show up at the market, I am going tomorrow for more. Thanks so much. Plums are the best and your cobbler looks so delicious. I used to have a plum pie recipe that baked in a brown paper bag and was absolute heaven! I haven’t been able to find it for a long time but I may need to look again. YUM! Pie baked in a brown paper bag, I’ve never heard of such a thing. You have to post that recipe. I am intrigued! Thanks Danielle, plums are the best!! I love cobbler toppings, I used to make one with a mix of fruits but I haven’t done so in a while. I like the idea of spiced plums it sounds nice. Yes me too, love cobbler, I was actually going to mix the fruit (love doing that) but the plums were just so good I thought I would just stick to plums and it turned out really great. Thanks so much. Oh yay!! I really look forward to seeing your galette. I love Turkish plums. Plums and a little spice go together brilliantly, i love making spiced plum jam. thank you so much! Thank you so much, I just love cobbler and summer fruit! Thanks Stefano, I think I would like this with a sparkling wine! Plums are one of my favorites- and these are just beautiful!! Thank you Francesca, plums and spices are fantastic together. Adds a whole new depth of flavor that is really delicious. Love the crust– cornmeal to make it homey and sour cream for tenderness. Oh yumm. Exactly, the crust is so tender and delicious. Thanks so much Rhonda! They were really tasty, thank you! Just beautiful Suzanne. They look delectable and fresh and with a beautiful crunchy exterior. I swear I can almost taste it right now! I really love your photo too…it’s bright and beautiful. Thank you Brandi, the plums were so juicy and sweet. I was so pleased with how they turned out. Wow! This looks so good! I love plums! I do too!! Thanks so much. I’ve never tried cobblers- only crumbles. And only apple crumble. Should give this a shot. I think you will like it if you try, cobblers are wonderful, a bit heavier than a crumble but in a very good way. Thank you so much. The color is so beautiful a deep red, I really love plums and am so happy to see them at the market. Thanks so much. Thanks so much Liz, summer fruit is the best and there are so many wonderful ways to use it besides eating it straight up!! You are VERY creative Suzie, I love your recipes. Thank you so much and I would really love to live close to you!! What fun we would have. Oh plums and peaches are my favorite fruits. This sounds so delicious! Thanks so much Victoria, it’s a toss up which one I like better in a pie or cobbler. They are both so good. love that you made individual cobblers – they look beautiful! Thanks, love doing individual cobblers you can easily make one larger one but serving those ramekins filled with cobbler is so nice. I’ll be copying you on this – I have all kinds of ramekins that I rarely use! Suzanne, I cannot wait to make and devour these!! Delish! Thanks Em, I would mix the plums with some of your wonderful plum jam and less or no added sugar. That would be delicious!! 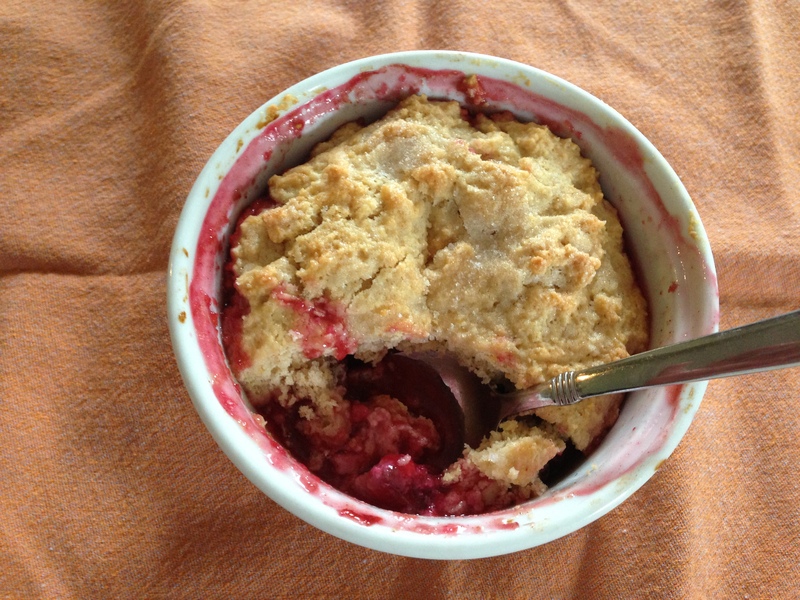 I can’t get enough of summer fruit desserts, Suzanne, and your plum cobbler looks scrumptious! Little bowls of comfort. I love fruit desserts and have to take advantage of the great summer fruit. Thanks so much Hannah! Oh thank you!! Love plums in any form, my favorite summer fruit. Wish I had a plum tree, jealous!!! Thanks it’s a really delicious cobbler, hope you like if you do make it. Thank you, I love making individual cobblers, it’s easier, less dishes too, LOL! Now that’s what I’m talking about. Nicely done! Love anything plum. Yum! Thank you. Me too, love plums! Thank you so much, I love this cobbler, it translates into any season really but late summer plums and apples and pears are delicious. Thank you, they are really good. I’m partial to plums Hope you like if you give it a try. Thank you, the cornmeal really gives the crust a rustic quality and the sour cream makes it very tender and slightly tangy, It’s a great combination. Thanks again. Whoops, that should be spices and baking…! Funny because thats how I read it, LOL!! We have a few months to go before we get plums can’t wait. Hope you enjoy if you make it and thank you. 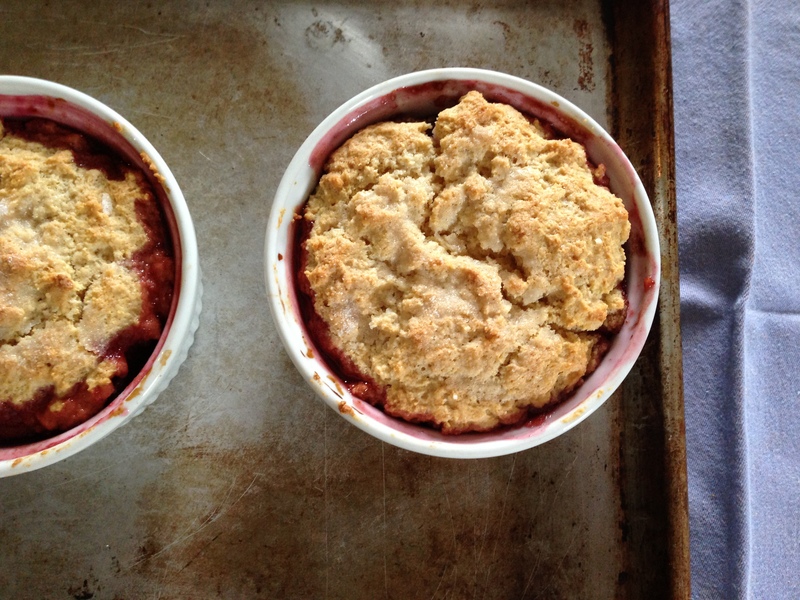 I love cobblers, and cannot wait for plums to be in season soon so I can make this. I just made a berry crisp tonight and we had an extended conversation about making cobbler soon. It was fate that brought me to your blog and this recipe. That, and Fiesta Friday! Thank you for the recipe and have a great week! Oh me too, thank you so much. Can’t wait for the summer fruits, this cobbler is one of my favorite recipes. Plums are an all time favorite and I hope if you make this that you enjoy. Thank you again. You’re lucky finding plums already. There’s not even a sniff of them over here. In fact, there aren’t even signs of a glut of strawberries this year. The weather really has been that strange. I do feel for the horticulturists in this county where I live as there are loads of orchards here. Anyway, a cobbler is something I’ve never had. Even though it’s very typically olde English. And I even have recipes for them. Now I know what to cook when I can get me some decent locally produced fruit! Oh no it was a cobbler I made last year. We have not seen a berry yet here. It’s been really cold. Can’t wait til they are at the market I will make this again it’s really good. Thanks. Hah! Too funny. I didn’t notice the date. And I’ve just spotted my gravatar as I scrolled down the page this time. I’m still doing my rounds at F&F, so I’m getting to those of you that turned up later on, so to speak. Talking of plums, they’re still selling them at my local store. How long have they been in storage for?! Just yummy! Delightful recipe, beautiful photos… now where’s my share?? Thank you, can’t wait for plums to come in season, you have an open invitation to stop by for some cobbler. Can I come, sounds delish! !